Our printer is only a few months old. I rarely change from the "Quickprint" settings so far, as I am still learning how everything works. So, on the Cura's default settings (whether I'm doing a high-quality or fast print), I keep having an issue where the infill is not coming in right. The exterior of the print looks perfect. Below is an example of what I mean. (Ignore the burnt bits - I had just switched materials, and the nozzle was having a little trouble with the new stuff at first, but it sorted itself. 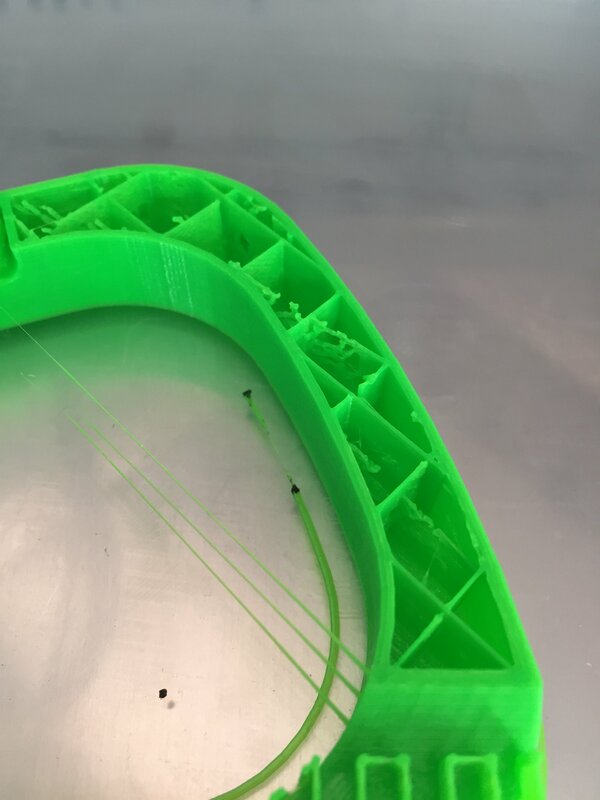 Switch to the advanced settings and see if you can find the settings for layer height, temperature, print speeds, and infill speeds. You may be experiencing underextrusion from it trying to print the infill too fast as the perimeter lines look fine. A lot of the times the default settings need some tweaking to produce good prints. I typically never use default settings as I have ran into a lot of issues with them. Once you start using the advanced settings mode and get a feel for it you can really discover what causes these issues. I'm not sure if they've changed this in the new Cura, but the default print speed on the infill was 80, while the perimeters were 30. This difference in speed causes the underextrusion, because while 210C might be ok for 30-50mm/s, it is too cool for 80mm/s which is why your exterior usually turns out ok and infill is spotty. So I would recommend you switch it over to advanced settings and checking to see that the infill is not much greater than the perimeters. Alternatively you can try bumping the temperature up to 230, which should be ok for 80mm/s but is a bit hot for the exterior. You're exactly right. The Inner shell speed is set at 80. I'll try it on a lower speed and see if that solves the problem. I appreciate your help! Very helpful. I'm hoping everything starts making more sense as I get into it.